Cleaning grout in your home can make the difference between selling your house fast or having buyers walk away! 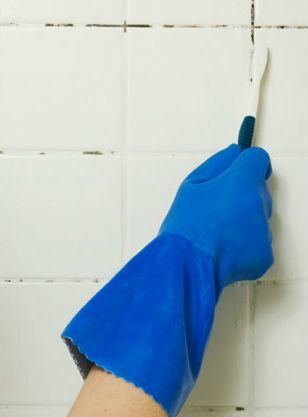 Dirty grout can make your entire bathroom, kitchen, or floors look old, tired and dingy. Cleaning floor and wall tile grout does take some time and effort, but the results are definitely worth it. When you're done with these grout cleaning tips, your bathroom, kitchen tiles or floors will look like new! And as an added bonus, the fresh looking tile will make your home look more appealing to prospective house hunters, sell your house faster, and keep buyers from negotiating the price down. Read on to learn some great methods on how to clean tile grout. There is a multitude of methods for cleaning grout, some of them quite unconventional. White vinegar - Heat 2 to 4 cups of white vinegar, warm not hot. Pour into a spray bottle and spray on grout lines. Let it set for a few minutes, then scrub with a sponge or brush. Rinse with clean water. 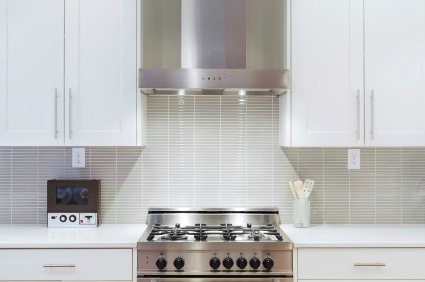 Who could resist this kitchen with the sparkling tile backsplash? I sprayed the shaving cream (Gillette Fusion Pro-glide Gel) on the grout lines and worked it in with my fingers. I let it set for 10 minutes. Scrub with a damp toothbrush or soft scrub brush, then rinse clean. White vinegar, baking soda & lemon juice - To 7 cups of water add; 1/3 cup lemon juice, 1/2 cup baking soda and 1/4 cup vinegar. Mix together well in a bucket, then apply the mixture to the dirty grout with a toothbrush. Allow the solution to set for a couple minutes, then scrub with the toothbrush. Wipe off with a damp rag. Listerine - If you type in, "How to clean grout," on google, a whole bunch of websites will pop up proclaiming the efficacy of using Listerine! Well...as so many people are big fans of using Listerine to clean grout lines, I had to try it myself. I wasn't very impressed with the result-- it did okay, but not as well as many of the other grout cleaners out there. If you want to try it, spray the Listerine on grout lines and leave on for at least 5 minutes. Use a soft scrub brush or toothbrush, then scour the dirt away. Rinse off with clean water. Baking soda & vinegar - Make a paste of baking soda and vinegar. You will need a damp toothbrush or small scrub brush as well. Apply to the grout lines and scrub with a brush until the grime comes off. Rinse off with clean water. See the video below by "essortment" for a demonstration on how to do this. Zep cleaning and whitening product is receiving great reviews by many! It is only for use on floor grout lines, but I have to confess to sneaking a little on my shower tiles as well, because it works so beautifully. Don't use Zep Grout cleaner and whitener on marble, stone, metal or Corian. ZEP doesn't contain bleach and requires little or no scrubbing when cleaning grout. Another positive is the lack of noxious fumes! 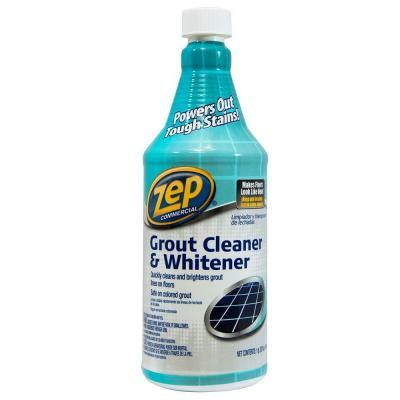 Zep Grout Cleaner and Whitener is inexpensive, easy to use and renders immediate results. This product can be found at Lowes, Amazon, Home Depot, and most home supply centers. This product not only whitens grout, it seals it too, making it more resistant to soil, stains, and mildew. 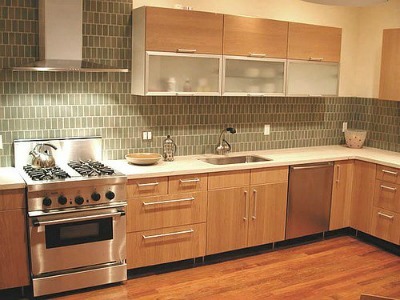 Apply the product carefully to grout lines according to the instructions, then use a stiff grout brush to scrub clean. Suitable for use in showers and on floors. Oxygenated bleach is a compound of natural soda crystals and hydrogen peroxide, and is non-toxic to humans. This is the preferred bleach for those who wish to live a "green" lifestyle. Mix up a solution of 1/2 cup of oxygenated bleach with 1 gallon of warm or hot water in a bucket. Stir until dissolved. Pour the solution onto the affected area in workable sections or dip a sponge into the solution and wipe grout until it's completely saturated. Let it sit for 15-30 minutes. If it dries while you wait, reapply more solution to the area. After 15-30 minutes, scrub the grout with a brush in circular motions to release the grime. With a clean wet rag, wash up all the lifted dirt, continually rinsing the rag as you go. Rinse with clean water. Repeat this process if necessary until the grout is clean. See the video demonstration below on how to clean grout with oxygenated bleach. Video by stainsolver.com. When all else fails, try cleaning grout with sulfuric acid! You can find "Tilelab Sulfamic Acid Cleaner" at Home Depot, Lowe's and other home improvement centers. When using this product, work in a well-ventilated area, wearing gloves, goggles, and protective clothing. Don't use on marble or other polished stone. It may also etch certain glazed tiles, so try it in an inconspicuous area first. Sulfuric acid is a very strong corrosive chemical. Mix in a bucket according to the manufacturer's instructions. Saturate the target area with water before applying the sulfamic acid mixture. Apply solution to the wet surface and scrub with a nylon bristle brush. Work in small manageable areas. Flush with clean water immediately or surface damage could occur. Note: After you have successfully cleaned your tile grout, you must reseal the area with tile and grout sealer to protect it. There are a number of tile and grout sealers on the market; TileLab Grout & Tile Sealer, Custom Building Products Miracle Sealants and more. Be sure to use the right sealant for your type of tile. You can find all these products at any home improvement center. For those who have a house full of tile flooring, far too much to go at with a toothbrush, you could hire a professional tile floor cleaner. Or, you could keep with the diy style, and go to the grout cleaning store to order your own supplies. Here you can find all the tools you'll need for the job; solutions, brushes, floor cleaning machines, and so on.